We will ship you one or more iDOcams the week of your wedding. One or more of your shutterbug friends will jump at the chance to record all the memorable moments of your day. They are going to be doing what they love to do anyway (take picture s & video), just have them use our iDOcams. We have found among every group there are friends or family members who would love to use their hobbyist skills and be a part of your wedding in a unique way. Some couples arm every bridal party member with a camera, or put an iDOcam on every guest table (or every row of the ceremony). Be creative, personalize your day. After the wedding you mail the iDOcams back to us. We will edit the footage and deliver to you a professional edited video of your wedding day! You will also receive all of the Unedited footage to watch and enjoy. We have several options for you to choose from depending on your budget and your expectations. We ship you one iDOcam fully charged and ready to go. 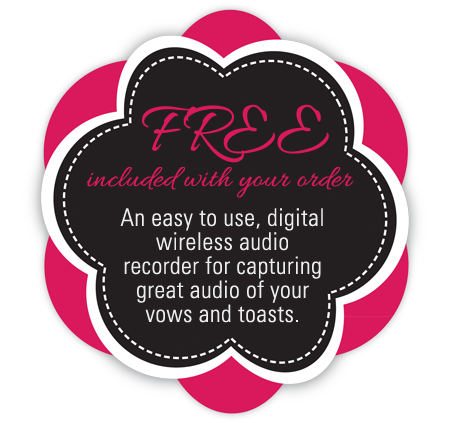 You will also receive a carrying case, mini tripod for stability, on-camera LED light and a wireless MP3 audio recorder for capturing great sound during the ceremony and toasts! Return the iDOcam after the wedding. An edited video of your wedding day in Full HD. You will receive two iDOcams fully charged and ready to go. You will also receive a carrying case, mini tripod for stability, on-camera LED light and a wireless MP3 audio recorder for capturing great sound during the ceremony and toasts! Return the iDOcam after the wedding. You will receive four iDOcams fully charged and ready to go. You will also receive a carrying case, mini tripod for stability, on-camera LED light and a wireless MP3 audio recorder for capturing great sound during the ceremony and toasts! Return the iDOcam after the wedding. All the raw footage you to enjoy as well. Many couples have approached us to edit footage they already have of their wedding day. Someone recorded video of their wedding but for one reason or another it has never been edited. We are happy to take footage shot on any camera and produce a professionally edited wedding video for you. Maybe your wedding is upcoming and someone has offered to film it with their camera which they would rather use than our iDOcams – no problem. We can edit the footage for you. Prices vary but are very reasonable so contact us for details.